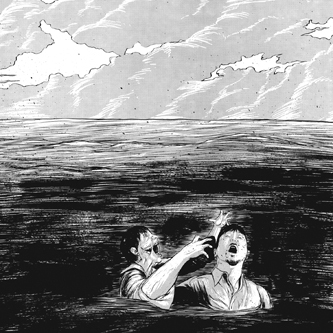 From Matthew Woodson's linocut cover art through to the macabre liner notes detailing a doomed nautical excursion, Xela's new album 'The Dead Sea' brings with it a pervading sense of unease before it even gets near your ears... Released on his own Type imprint, 'The Dead Sea' sees John Twells (aka Xela) eschewing the electronic overtones of his early work in favour of a thickly evolved palate of sound that references the likes of Goblin and Wolf Eyes, whilst retaining a mischievous heart that thrives on its skin-crawling rhythm. With a tacit nod to the soundtrack flavour of Dario Argento, Lucio Fulci and George Romero et al., 'The Dead Sea' opens through the frayed drones and nervous percussion of 'The Gate'; wherein Xela serves up a deliciously claustrophobic introduction that is both cloying and unflinchingly expansive. Seemingly aware that 'The Gate' will have put the chills up many listeners, Twells allows a chink of light to shine through on the following 'Linseed' - as a viscous swirl of acoustic guitar is gradually folded into gravelly rhythms and wheezing soundscapes. Like a Victorian portmanteau which slowly reveals its collection of delights and horrors, 'The Dead Sea' undoubtedly serves up a bijou treat in the form of 'Drunk On Salt Water'; a towering landscape that underlays piquant chimes and smoky instrumentation with a cobble-street of clunking percussion. Elsewhere, the ruptured electronics of 'Creeping Flesh' prove just how alarming digital ghosts can be, 'Humid At Dusk' is a nightmare heat haze of fizzing elements, whilst 'Briefly Seen' offers a sunset blush of optimism. Closing on the muffled solipsism of 'Never Going Home', 'The Dead Sea' shows an artist unafraid to traverse inky waters - and in doing so Xela has produced an album that oozes warmth through its midnight compositions. Essential purchase.